TECHWOOD is made from natural organic fiber & PVC in extruded from, creating the next generation of composite building material. TECHWOOD is user-friendly and it substitutes other traditional wood or plastic building materials. TECHWOOD products are designed for Outdoor & Indoor applications including decking, railing, cladding, false-ceiling and other decoration work. Techwood TECHWOOD products are free from conventional wood problems such as splitting, warping, decay and are 100% waterproof and termite proof. TECHWOOD is a revolutionary product, very apt for exterior cladding and has been widely used in Western countries. It is most suitable for renovation of old fashioned exterior. It gives the elegant look of wood and apt for those who want to upgrade from conventional ACP/Metal/Glass cladding. TECHWOOD is very easy to install and to revamp the exterior & interior of showrooms, as it can be readily covered on metal partition, front fascia, rooftop, gate fascia etc. It doesn’t even need frame work as it can be directly nailed, screwed or pasted on walls & use metal channels for false-ceiling. The TECHWOOD products has got a lifetime guarantee for its quality. 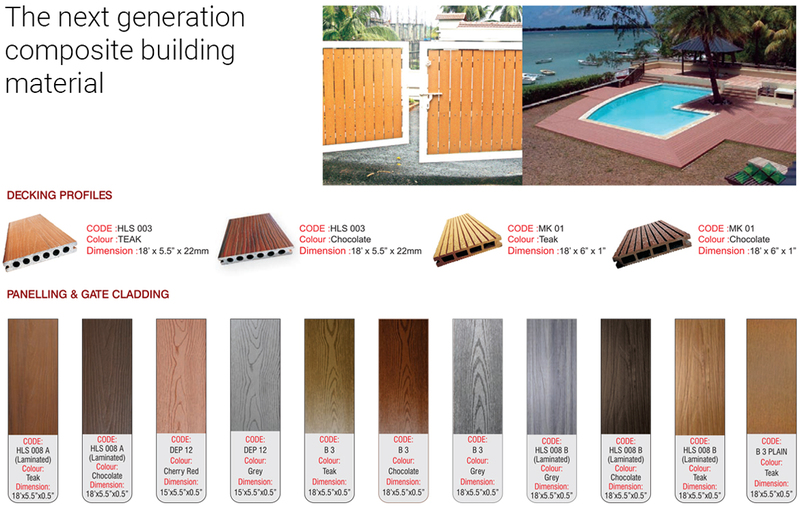 The colour shades are guaranteed against extreme weather Conditions TECHWOOD profiles are most suitable for Swimming pool floors, Garden pathways, Shower/Toilet flooring, Wet area floors, Staircase steps, Automobile floors and many kinds of anti skid applications. TECHWOOD provides user friendly Handiclip system to install the decking / flooring to strong and solid installation by not having those unsightly nail/screw heads showing. 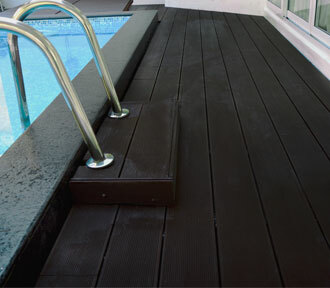 Decking & flooring of Swimming pool.